Persian santur (san-tour) is a fixed string musical instrument which is played with a couple of light wooden hammers. Santur has an isosceles trapezoidal shape. Its overall shape, tuning design, and playing methods are similar to the American hammered dulcimer and East Indian santoor. Santur’s origin traces back to other instruments “played by striking cords with hammer like implements,” back to ancient Persians in the Middle East, India, and perhaps ancient China. Contemporary santur design, however, is most likely no more than two centuries old. This santur is prevalent mostly in Middle East, but is also used in Greece and Turkey. There are many variations of santur design depending on the region of origin, the musical notes it produces, and preferences of instrument maker and musicians. In fact the santur images in this article vary somewhat from the stated design specifications. In this article, we focus on a santur design that is most popular in contemporary Iran or Persia. Persian pronunciations (e.g. santour) are included (in italics) as a courtesy to the culture that has fostered the evolution of this instrument over centuries. A glossary at the end provides the words in Persian script. Santur provides over three octaves of musical notes (E3 – F6 or mi3-fa6). Each musical note is delivered by a course of four strings (seem) tuned exactly to the same pitch. The strings of same course share the same chessman style bridge (kharak). In this design, there are two columns of nine courses each, with bass courses on the right, and treble courses on the left. 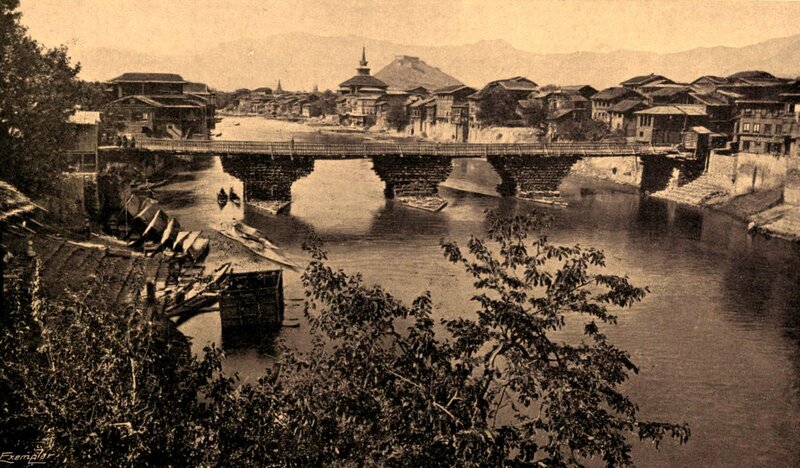 Accordingly, this type of santur is named Nine-bridge (noh-kharak). Treble bridges are positioned so that the resulting two (left and right) treble courses provide two consecutive musical octaves (higher and mid-range) with one additional overlap note. Bridges are positioned on the soundboard. Santur soundboard rests on the frame (kalaaf) which consists of top rail, bottom rail, and hitch pin block on the left and tuning pin block on the right side. Santur frame is attached to the back board opposite to the soundboard. The space encased by the frame rails, soundboard and back comprise the santur soundbox. Every string originates via a loop from a hitch pin (seem geer) over the left side bridge (sheytaanak / zehvaareh) and saddle rod (maftool), sharing a bridge with three other strings in the course. The string then travels to the right side saddle and side bridge and is eventually wound around its own tuning pin (gooshi). There are 72 strings, hitch pins and tuning pins in a “Nine-bridge” santur. Bass bridges are arranged with the top bridge positioned at 50MM, and bottom bridge at 130MM from the right saddle The musical notes on the right side of bass bridges are not used. The nine phosphorous bronze alloy (bass) string courses provide (E3 – F4 or mi3-fa4). The middle and higher octaves are played on the steel (treble) courses in the middle and left side which are tuned to (E4 – F5 or mi4-fa5) and (E5 – F6 or mi5-fa6) respectively. The two most popular Nine-bridge santur types are distinguished by the tuning of the third (from the bottom) bass course. The most prevalent version has this course tuned to (G3 or sol3), and is traditionally known as G-tuned (sol kouk) santur. The other less popular version is tuned to (A3 or La3) as third bass note, and is traditionally known as A-tuned (La kouk) santur. The latter type provides (F3 – G6 or fa3-sol6) musical note range. This article will focus only on the “Nine-bridge” G-tuned (sol kouk) santur. Santur is mainly used in playing traditional (sonnati) music of Persia. It is not conducive to playing Western style music. Persian and generally Middle Eastern music has much more complex nuances than could be discussed here. Most common practice in Persian traditional music is to use the chromatic scale. Tones similar to Quarter-tones (half semitone) notes are also used routinely. A quarter-tone is equal to 50 cents or 2 Pythagorean commas. The scale of Persian music is not fixed on the same twelve notes. Accidental notes are used routinely. Because of these complexities which add additional burden of re-tuning, violin, Persian oud, and other non-fretted instruments are much easier to tune for Middle Eastern music. Quarter-tone note tuning of santur is often accomplished by moving the bridges and not using the tuning pins. This practice, although convenient for the musician, diminishes somewhat the acoustic response of the santur if not its structural integrity. Persian traditional music differs from its contemporary rhythmic counterpart in that it is melodic, mostly slow and very structured. Singing in the traditional Persian music, to the ears of Westerners, is an enchanting blend of yodeling and Western opera. Traditional Persians are passionate about poetry. The traditional music lyrics though lacking opera like story line, is poetry-based and somewhat similar in lyric tone to that of American blues music. A typical santur structure is said to be under a tensile force equivalent to 900 + Kg (1,980 lb or one ton). It is generally made to be light and portable typically (3–4 Kg or 8 lb), and constructed of thinnest-size parts. From a structural viewpoint, it is relatively no less complex than a wide underground tunnel designed and built by civil engineers. Santur design has an additional requirement in that it must produce pleasant and uniform volume musical sounds. The santur frame (top rail, bottom rail, tuning pin block, hitch pin block) resides between the soundboard and the back, and provide the bulk of support for santur’s structure. The frame also plays a role in the tonal quality of the santur. Top side of frame where it is in contact with soundboard is tapered down on the interior edge to minimize the contact area between the soundboard and frame rails. Top and bottom rail provide the main structural support to the pin blocks and somewhat contribute to the acoustic performance of the soundbox. Bottom rail has a sound hole at its center. This design differs from typical Persian santur in that the pin blocks are lapped over the ends of top and bottom rails. Top and bottom rails are thus not extended all the way to the corners or dado joined as practiced in Persia. The lapped-over joint is said to provide better support for the pin blocks. Some Persian santur makers glue three layers of hardwood with the middle later in a transverse grain orientation to prevent cracking of the tuning pin block. Hammered dulcimer tuning pins will work just as well. Refer to the supplier’s specifications for pin sizes. Hammered dulcimer hitch pins will work just as well. Refer to the supplier’s specifications for pin and drill bit sizes. There is one hole for each string in the tuning and hitch pin blocks. The holes are arranged in a single column, although some suggest staggering of the holes as well. There are eighteen columns and four holes per column. Drilling these 144 holes in the pin blocks is a tedious process, and requires accuracy as well as patience. Using jigs and prior practice is definitely recommended. Soundboard covers the upper part of frame rails. Be sure to drill / carve the sound holes at proper location on the soundboard before gluing. Soundboard is the most costly piece in santur in terms of the wood, cut and quality. Use a separate 10MM thick piece of scrap wood on top of the soundboard when and if drilling to prevent splintering. Practice drilling on scrap wood first. A good soundboard is made of dense and dry wood like walnut. It has uniform fine wood grain lines (2–3MM apart) in parallel with the strings with little or no anomaly in the wood pattern. Thinner soundboards provide best tonal quality in a santur. The vertical stress on the soundboard comes from the bridges (downward) and from the frame rail and soundposts (upward). The areas on a soundboard most vulnerable to cracking are the strips at the top and bottom edges of the soundboard, between the frame rails and the nearest bridge. Some santur makers vary the thickness (up to three different sizes) of the different regions of soundboard to accommodate this. You will find it easier if you measure the exterior dimensions of soundboard and back slightly larger (1–2MM) and trim it by sanding or routing after the construction is completed. Mark the precise location of sound holes on the soundboard. Back board encases the lower part of frame rails completing the soundbox and supporting the soundboard via soundposts. It will help a lot to draw the diagram of santur on the back board and identify precise location of soundposts, frame rails, etc. You will find it easier if you measure the back panel slightly larger (1–2MM) and trim it after the construction is completed. Mark the precise location of frame and soundposts on the inside of the back board. There is also one “tuning” soundpost which is intended to balance or regulate the tonal balance of santur’s music box. The latter is installed only after the santur is completely assembled and a string is tuned. Tuning soundposts are not glued at all. Bridges are customarily turned from hardwood; one bridge for each course in contemporary santurs. Taller bridge heights are used with harder wood like walnut. Taller bridges also increase the stress on the soundboard. Individual bridges in santur facilitate semi/quarter tone adjustment of string notes by moving its bridge instead of using tuning pins. This practice is counter to maintaining the structural integrity and tonal quality of a santur, and may shorten the useful life of a santur. Bridge bottom (khazineh) surfaces are carved (actually turned) in a concave manner with a rim of about 1–2MM wide, and depth of 1–1.2MM. Bass bridges are located with string length of 50MM and 130MM from the right saddle (top and bottom respectively – center to center). Treble bridges are located at approximately 1/3 distance (center to center) from the left saddle so that the left side of each course produces the pitch of the same note in the next higher octave. Bottom surface of bridges should be sanded and polished to a smooth surface. Bridge cap (saachmeh) should be made of tempered nickel plated steel rods. Do not use Delrin rods or bronze rods for santur. Make side bridges from hardwood like walnut. Tuning side bridge is installed with 2MM over-hang along the pin block. Saddles or side bridge caps should be made of tempered nickel plated steel rods with same material and diameter as hitch pins. Do not use Delrin rods or bronze rods for santur. Selection – More dense varieties of walnut and birch are the primary wood used for making fine santurs in Persia. Other hardwood such as Siberian Elm (Choob-eAazaad), betel palm (foofel), and mulberry wood have also been used. Autumn lumbered, fine fiber dense wood from warm and dry climates is more suitable for making santur. The narrower and closely aligned grain lines, the more suitable the wood. Forest grown trees tend to grow more straight and thus produce more uniform wood than the urban variety. Climate change and other factors influence the closeness and width of the rings in cross section of trees which produce the grain lines. There should be no knots or other anomalies in the wood grain of the soundboard. Use of soft or unseasoned wood should be avoided. There is no requirement that you use different types of wood in santur. The same type of wood can pretty much be used for all the pieces. Seasoning – The wood for musical instruments must be prepared dry and free of tree sap and oil. Steaming is sometimes used to dissolve and extract the tree sap within the wood fibers for thinner pieces. Heating of the wood in a large kiln or pizza oven is another method to “boil the sap” out of the wood. This process requires experience and care must be taken so that the wood remains hard yet flexible. Fully seasoned wood should have between 12-15% (never over 19%) moisture and this could take a long time if it is done naturally. The wood that is dried naturally in the shade and in the flow of air for an average of a couple of years produces the best sound quality. Wood that has not been seasoned adequately is susceptible to warping and produces inferior tonal performance. To maintain a good sound quality, keep the santur away from exposure to moisture and sunlight. Store this instrument in its own case with desiccating chemicals or drying agents. Use only the type of steel string made for musical instruments (music or piano wires). Strings are susceptible to rusting in humid environment. Chrome or nickel plated music steel wire is used for treble strings and phosphorus bronze plated steel music wire is used for bass strings. Gauges are .015″–.016″ (.38MM–.41MM). All strings are looped at hitch end, and wound at tuning end, with minimum of (7) windings to ensure stable winding. Santur is played with a couple of wooden hammers (mezrab), much thinner, lighter (4 grams) and traditionally more ornate than those of American hammered dulcimers. The short dimensions of santur hammers (22–24MM x 30MM) make it possible to use just about any types of dry light, very dense but high resonance hard wood like rosewood. The striking surface tips of hammers are sometimes covered with felt to produce a milder sound. Use an adhesive that provides a good bond and cures to at least the same hardness as the soundboard. Persian santur makers use a gelatin based hot hide glue (serishom), which when heated indirectly and applied, dries to a hard, durable and moisture free texture. Steam is used in a double layer pot to heat this glue. You can use any type of glue which is appropriate for American hammered dulcimer including Franklin’s Tightbond II. Santur finish must dry fast without much penetration in the wood; protect exterior of santur surface against heat and moisture; endure high pressure from bridges and transmit vibrations from the bridges to the soundboard without flaking or cracking. Persian santurs are coated with a natural spirit varnish after the trimming, sanding and sometimes staining. The varnish is a mixture of lacquer as main resin and alcohol (lock-alkol). Somewhat darker non-reflecting finishes are preferred for santur. Color pigments stains are also used to improve color tone of lacquer. Violin shops are good places to get advice about varnish for santurs. Santur building is a time consuming project. Measurements must be made with less than one Millimeter tolerance. Having a viable blueprint and instructions is a must. If you are not experienced with woodworking, or have not previously built musical instruments, practices building each piece with scraps of wood until you are satisfied with the results. It is helpful to construct each piece as specified before attempting assembly. It also helps to build a frame jig from scrap wood that would surround and hold the frame of your finished santur frame while the adhesive cures. Always have the retaining clamps ready to use. Dry run the gluing process before you actually apply the glue to make sure everything is ready once the glue is applied. Practice gluing and curing on scrap wood to gain expertise in glue application. Always wipe any extra glue immediately after the clamps are applied. Take care to not let the adhesive get on the surrounding jig or retaining clamps. After the curing of the glue is complete, sand the inside of any visible glue. Sand and dust the inside surfaces to a smooth finish. Inside of your santur soundbox should be somewhat smooth and free of any visible glue marks. Do not use nails. 1. Prepare the Pieces – Cut and prepare each piece in precise dimensions according to the blueprint. You will find it easier if you measure the soundboard and back panel slightly larger (1–2MM) and trim afterward. Draw the layout on the interior surface of back board and identify the position of the support soundposts on the drawing. Draw the layout on the exterior surface of soundboard and identify the position of the sound holes on the drawing. Pre-drill all holes in pin blocks. This is probably the most difficult part of building a santur as these holes are all at angle to the pin block surface (parallel to the courses). It is helpful to use a template or more preferably a jig to obtain precise cuts and holes. For best holes, keep your drill bits sharp and cool. A wood hole with charred inside will not be able to hold the string tension. When drilling, use separate10MM thick pieces of wood scrap between the drill and the santur surface to minimize splintering. Use a stopper guide or bushing around your drill bit to prevent drilling through the pin blocks. 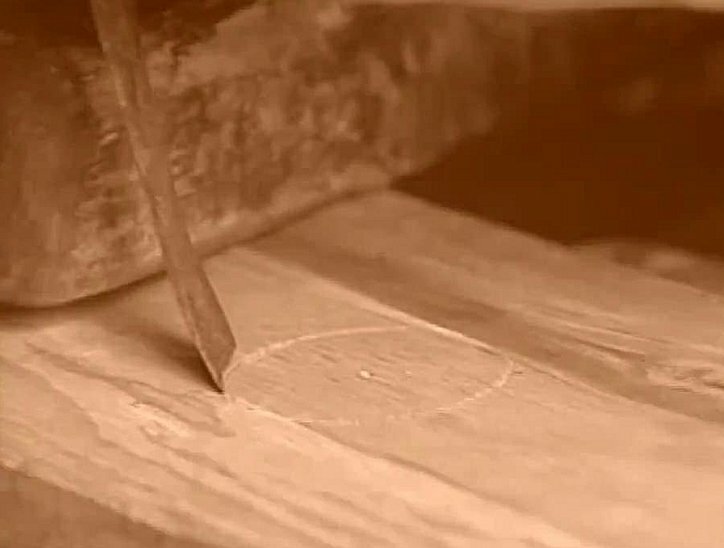 American dulcimer makers have found that counter sinking the holes by 1–2MM improves the aesthetics of their instruments. If you mis-drill a hole, the whole pin block will most likely need to be replaced. Blow out any dust that may have collected inside the pin block holes. 2. Glue Soundposts to Back – The back and soundposts can be cut and assembled at this point. Use a level or lay the back on top of the soundposts to verify uniform height of soundposts. A thread spool- like block may be used to ensure the correct vertical orientation of the soundpost on the back while the glue is curing. Take care to insure vertical orientation and uniform height between soundposts. Remove any dust from interior of the pieces. Dry fit the frame pieces together on a flat surface to ensure tight fit, uniform height, and adequate surface contact. Test use of jigs and / or clamps to hold the glued pieces together while curing. Glue the frame pieces two pieces at a time (top rail and hitch block, and bottom rail and tuning pin block), and then complete the gluing of the final two pieces. There are two approaches in the way you order gluing the back and soundboard to frame. The first approach (practiced in Persia) glues the frame to the back first, then the soundboard. The second approach (described here) would glue the soundboard to the frame first then the back. The advantage of the second approach is that if there are any problems with the height of the soundposts or if you feel you must correct for any warping in either boards, you still have one more opportunity to adjust the height of, or even replace a soundpost. A second advantage of the latter method is that gluing of the soundboard to the frame is more of a delicate process because the surface being glued is tapered. Gluing and having access to the interior side of the glued surface enables you to better clean any glue overlap. You do not have that option with the first approach unless you remove the back first. 3. Glue the Soundboard to Frame, then Frame to the Back – Spread the glue only on the narrow flat edge near to the exterior edge at the top of frame where the soundboard would be attached. It is important that you use the glue sparingly, and avoid gluing the tapered part of the top of the frame. Place and glue the soundboard on top of the frame using sturdy clamps. Verify that the height of soundposts is 1–1.5MM above the frame by placing the back on top of the frame. The back should sit on soundposts with a 1MM gap with the frame. This is a critical step. If a soundpost is too short, the benefit of soundposts is essentially nullified and buzzing may even render your instrument useless. If a soundpost is too tall, it will create problem for other soundposts. Correct any problem before proceeding to the next step. Next glue the frame to the back being careful not to tip over any of the support posts. Do not glue the top of supporting posts. You will need to use a dozen sturdy clamps to press the frame against the back in spite of the resistance by the soundposts. Do not remove the clamps until the glue is fully cured. This may take several days. Once the glue is cured, any over-hanging part of the soundboard and back may be removed by sanding or routing. After the bond between the back and frame rails is cured, the side bridges may be glued and clamped on to the soundboard. 4. Mark and carve the string guide notches on the exterior side bridges -Santur strings tend to ride up toward the top side if not guided properly. The grooves or notches on the outer edge of side bridges play an important role in the spacing between and alignment of strings on the bridges. If these notches are not laid properly, the player will see uneven spacing of strings on a course and between courses which is least desirable. It may help to use wooden dowels in tuning pin holes so that proper contact point of the strings with tuning pins may be best approximated. Place saddles on both bridges. Mark the top outer edge of the side bridge where the center positions of the 18 courses will be located. The center position is half way between the second and third string in a course. Mark the notch locations 2MM apart measured along the bridge length around the center positions. Bend a solid 2MM thick wire in form of letter “J” with a length of 100MM and bottom diameter equal to the diameter of a tuning pin. You will be using this J-rod to approximate the path of the string for which you are creating the notch. Mark the side bridges as close to, and parallel to the J-rod direction. Continue this process for the bottom and top strings of every course, and then mark the position of other strings evenly. Use a very thin (0.3MM) finishing X-acto razor saw to carve the notches starting at the top of the bridge and ending about 1MM below the top surface of the pin block. The groove depth should be curved to best approximate the natural path of the strings from saddle to the tuning pin. Place the string inside the first few grooves to test the correct angle and width of the cut. If you cut too shallow, the pressure from the strings may crack the side bridge or work against the adhesion of the bridge to the soundboard. If you cut too deep it may undermine the ability of the side bridge to keep the strings in tune. You may want to practice on a scrap wood first. Repeat this process for the hitch pin block. It is customary to test the sound quality of the santur at this point. An experienced ear is an absolute requirement. First tap the instrument with finger tip and listen to the echo sounds form the music box. Next install a single string for the treble “B” or “C” course including the bridge in the correct location and examine the sound. The string and hardware is removed following this test. 5. Apply stain and finish – Give your santur its last sanding and clean it dust-free with a tack cloth. If you plan to stain your santur, be sure to use an alcohol (not water) base stain. Moisture is the #1 enemy of the tonal quality of santur. Use a small rag, soaked dry in stain to lightly rub the surface of santur. Darker colors and mat finishes are preferred because they minimize reflection of light from playing surface and make it easier for the musician to see the string courses. If the colors are too dark, they show off dust and absorb more heat from sunlight. You may need to repeat this step to darken the stain, but avoid pressing the rag against the surface as doing this will enable the moisture to get inside the wood. Be mindful of getting any stain or finish inside the pin block holes. Pat dry (or floss) corners, edges and groove areas where the stain tends to over-darken the surface. Place the santur in a moisture free warm location and let the stain dry completely (up to several days) before applying the varnish. The best varnish product for a santur is one that dries to a durable finish; the harder the better. Let the finish dry for a few days. Persian santur makers use a mixture of natural colors by boiling skin of walnuts, pomegranate, copper sulfate and tree sap. As a varnish, a 1:3 mixture of lacquer or shellac flakes and methyl alcohol (lock-alkol) is also used. 6. Install hitch and tuning pins – Gently tap in the hitch pins so that all but 5–7MM of it remains outside of the hitch pin block. A uniform protrusion of these pins enhances the appearance of your santur. Practicing the next few steps on scrap wood is recommended. It is helpful during tuning to use blue plated tuning pins for treble strings and nickel plated pins for bass strings. Measure the depth of a tuning pin hole and mark the tuning pins so that your tuning pin will not penetrate the holes beyond their depth. Doing so will crack your tuning pin block. Gently tap the first 1–2MM of the tuning pins into the holes until you get a straight and firm footing and then screw in the next few MM until you feel the tight grip of the wood. You will be turning the tuning pin clockwise. Do not use power tools for this step and do not press the tuning pin in while turning it. A wooden dowel with markings can insure uniform penetration between pins. You may want to test the adequacy of penetration of tuning pin on the upper treble strings first. 7. Install the bridges and strings – The upper strings of courses are installed first. The remaining strings are installed from bottom up alternating between the treble and bass courses. Loop the strings by clamping the ends of a loop (50MM long) adjacent to each other in vise, and turning the loop with a steel rod exactly 7 revolutions. Other method will suffice. Install the string by hooking the loop around the hitch pin inside the corresponding side bridge grooves and over the side bridges saddles. Keep the string taught while threading. Take care to unwind the string from its spool while doing so. Thread the string through the corresponding tuning pin eye and cut the string with about 60–70MM slack beyond the tuning pin. Bend the last 5MM tip of the string to make it easier for the string to stay in the tuning pin eye. You will be turning the tuning pin clockwise with the saddle side of the string rapped on the inside. It is helpful to guide the string with your fingertip. Keep an eye on the alignment of the string with the side bridge grooves. When the tension on the sting is tight enough to hold the string, continue to install the other strings in the course. Install the bridge for the courses. Wear eye-protective gear while doing this. Snip any excess string from the tuning pin. 8. Tuning the Santur – Tuning the strings is done by using a Tuning Wrench (kelid) that matches the end shape of tuning pins. Santur strings are ordinarily tuned to the key of G from bottom to top (E F G A B C D E F) with the middle (C – do) bass note being equivalent to the middle C 4 in piano. Check the alignment of bridges before you start tuning the strings. Tune the top and bottom treble strings and double check the harmonic pitch of the left and right treble strings. Tune the santur one octave lower first time and let it rest for a few days to allow the wood to adjust to the string tensions. Tune the top string of a course for all courses, and then continue with the second string and so on until the first tuning phase is completed. After the first tuning phase is complete, check the sides of the santur for signs of warping. The tuning of the soundbox is made by installation of the tuning soundpost. The purpose of this soundpost is to regulate the echo characteristics of the soundboard so that a pleasant and uniform volume is produced by all santur courses. This step is rather tricky in that that it is used to adjust the lack of balance of sounds across courses. Furthermore, access to the inside of the soundbox is limited to the treble sound hole and the hole at the center of the bottom rail. The method used in Persia is as follows. The soundpost is held by two long nose metal pieces (like chopsticks) which are bent in the middle for better handling. A fabric string holds the soundpost firmly between the chopsticks. The string is knotted in such a way that by pulling its end, the soundpost is disengaged from the chopsticks thus allowing you to retrieve them from inside of santur. As of late a new tools have been devised to accomplish this. You may need to improvise your own installation tool. Final tuning of santur may be accomplished at this point. Never tune the santur to higher octaves as doing this will structurally damage the instrument. As with all musical instruments, good playing techniques from the onset help the musician avoid poor habits. To play the santur, the player stands, or sits on the floor with legs crossed, facing the santur at the bottom end. The payer’s forearms are held parallel and approximately 100–150MM above the soundboard. Santur hammers are held between the index and middle fingers, and are moved by the wrests, and not by the forearms. Courses are struck 30–40MM from the bridges. Acquiring these playing skills is said to take a long time. Santur case is made of a hard shell, and is padded on the inside to protect santur against shock and moisture. Santur strings should be loosened when freighting or transporting santur in rough train to protect the soundboard from cracking. Drying agent (Silicone based) packets are recommended to be used inside the santur case in humid climates. The contemporary santur in Iran owes a great deal to the dedicated lifetime work of santur makers such as (Mehdi Naazemi). These master instrument builders contributed to Persian music by leaving a legacy of not only beautifully sounding santurs but more importantly by sharing their decades of knowledge and experience with others. The goal of this article is to document a design for santur in form of an introduction including the text, diagrams, design parameters and other specifications. The target audience is the Guild of American Lutherie readers and English speaking instrument builders who generally have access to woodworking information and supplies. Although every effort was made to keep this design reasonably close to the overall contemporary santur specifications, it is not represented as an authentic, acceptable-by-all authority on this instrument. The author’s hope is that this article will begin a dialog on this instrument amongst the instrument experts, builders, and musicians through whose participation, will emerge a future standard and guide for design and construction of contemporary Persian santurs. The author is indebted to Tim Olsen for his graphic support, editing and most of all coaching and patience, and to Nasser Shirazi for courteous encouragement and valuable information sources he unselfishly offered to this project. There is an immense amount of information about material and construction tips for hammered dulcimer and other musical instruments in GAL archives, books and Internet that would be very helpful to santur builders. Born in Neyshabur in 1955, he began his musical training at the age of six with his father Hassan Meshkatian, who was a professional tar and santur player. He learned the radif, the total collection of more than 200 gushehs — traditional melodic entities — in all 12 dastgahs, studying under Iranian maestros Nur-Ali Borumand and Dariush Safvat. He was also a student of Mohammad-Taqi Masudieh, Abdollah Davami, Saeid Hormozi, and Yusef Forutan, who helped him improve his skills. After some years, he became one of Iran’s most prominent musicians. In 1977, Meshkatian founded the Aref Ensemble with Hossein Alizadeh and Mohammadreza Lotfi. The group performed many concerts in Iran, Europe, and the Americas. He was also one of the founding members of the Chavosh Artistic and Cultural Foundation. The Chavosh foundation has played a major role in the development of Iranian music for a few decades. He also performed with some of Iran’s greatest vocalists like Mohammadreza Shajarian, Shahram Nazeri, and Iraj Bastami. The collaborations resulted in the creation of the albums “Bidad”, “The Court of the Beloved”, “Mystery of Love”, “Nava”, and “Dastan”, which are all very popular in Iran. Meshkatian toured Europe and Asia and regularly performed in countries such as France, Germany, England, Sweden, Netherlands, and Denmark. In the spring of 1982 he published the book Twenty Pieces for Santour. In spring of 1992 Meshkatian and the Aref Ensemble won the first prize of the Spirit of the Earth Festival in England. Der wohl größte Santur-Spieler unserer Zeit starb im Alter von nur gerade 54 Jahren. Meshkatian galt als genialer Musiker, Komponist und Orchester-Leiter und war einer der wenigen Giganten der klassischen persischen Musik. Er war eines der Gründungsmitglieder des Aref Ensemble’s (gegründet 1977) und vom Sheyda Ensemble. Er tourte durch Europa und Asien und trat regelmässig in verschiedenen Ländern Europas auf. 1982 veröffentlichte er das Buch ‚Twenty Pieces for Santour’. 1992 gewann er mit dem Aref Ensemble den ‘First prize of the Spirit of the Earth Festival’ in England. In Zusammenarbeit mit Mohammad Reza Shajarian produzierte Meshkatian einige der schönsten Aufnahmen der zeitgenössischen persischen Musik. Meshkatian starb am 21. September 2009 viel zu früh an einem Herzinfarkt. Die Welt verliert mit ihm ein Genie der klassischen persischen Musik. The news of Parviz Meshkatian’s death was an unbearable and unbelievable. The Iranian music community and many ordinary people burned with the grief of losing one of the most influential artists in the genre of Persian classical music and the source of musical creativity. Meshkatian was born in the year 1955 in the city of Neishabour. The city which is located in eastern Iran, the province of Khorásán. If Iran’s history can be divided into two main phases which are pre-Islamic Iran and Iran after the advent of Islam, Khorásán will be the cradle of Iranian art and science in the second phase of its history. This region is the birth place of Persian poetry and mysticism as well. It is where Ferdosi, Attar, Khayam, and many others were born and raised. Meshkatian started his musical training at the age of six with his late father, Hassan Meshkatian. The late Meshkatian played the tar and the santur masterfully and was also familiar with the violin and the setar. Meshkatian entered the Music College of Tehran University and studied theory and technique with the masters Nur Ali Borumand, Dariush Safvat, Mohammad Taghi Massoudieh, and Mehdi Barkeshli. He chose the Radif of Mirza Abdollah as his main topic of research. After finishing his academic studies, Meshkatian continued the study of music with such masters as the late Abdollah Davami, Saied Hormozi, and Yousef forutan. He won the first prize of Barbad competition in the field of santur. Meshkatian was among a few musicians who demonstrated his incredible musical creativity and talent since his early age. While he was still in his twenties, Meshkatiyan joined the Iranian Radio and began to collaborate with many distinguished musicians. He was one of the founding members of the Aref Ensemble, founded in 1977. He was also one of the founding members of the Chavosh Artistic and Cultural Foundation. The Chavosh foundation which was both a conservatory and cultural center played a major role in the development of Iranian music in the recent years. At Chavosh, Meshkatian cooperated with the influential musicians such as Mohammad Reza Lotfi, Mohammad Reza Shajariyan, Hussein Alizadeh, and Shahram Nazeri. Meshkatiyan along with Lotfi and Alizadeh composed and performed many beautiful pieces which attracted the youth and made Persian classical music popular among the younger generation. One of the main aspects of Meshkatian’s character was his awareness of the political and social situations of his time. In 1979 before the Islamic Revolution when the country was in its political upheaval and some people were killed in the event of the Jale Square, he along with the musicians of the Chavosh Institution resigned from the Radio. He composed several songs during the Revolution which became very popular. Two of these songs sang by the most famous singer of Persian classical music, master Mohammad Reza Shajarian. Meshkatiyan composed many beautiful pieces in different genres of Persian classical music. He composed many songs for master Shajariyan and produced some of the most beautiful recordings of contemporary classical music of Iran. Meshkatiyan also composed many instrumental pieces which are very beautiful and rich in the technical sense. Master Meshkatian performed in Iran and throughout the world. In spring of 1992 Meshkatian and Aref Ensemble won the first prize of the Spirit of the Earth Festival in England. Master Meshkatian also taught the santur and radif at the music college of the Tehran University, Chavosh Institute, the Center for the Preservation and Dissemination of Music, and also privately. Many of Iran’s santur players of the recent generations have been his students or have been influenced by him. He also published the book titled “Twenty Pieces for Santur” and many of his works are ready to be published. Meshkatian was not among those musicians whose works are only appreciated by the experts. In fact, his works were understood by the masses and admired by the experts. He is among the major figures who, in the past thirty years, have revolutionized the Persian classical music. His innovative approach of combining the traditional with new elements, both in terms of music and technique, has injected a new vitality into a very old tradition. His original creativity and the deep-rooted emotional quality as well as the knowledge and understanding of the Persian classical music repertory or radif as well as Persian poetry have made him a unique figure in the realm of Persian music. As master Hassan Kasai, the prominent nay player of Iran, wrote as a part of his condolence letter “Meshkatian was the gem of the Persian music ring”. Pune-based santoorist Dilip Kale speaks about Pandit Shiv Kumar Sharma only in superlatives. Not only because he’s Dilip’s guru, according to him the renowned musician is a wonderful human being too. “Ever since he accepted me as his student, my life changed for the better,” he says. 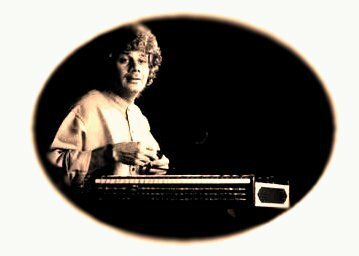 Before Dilip took to playing santoor, he was searching for the perfect medium to express himself. He is also a trained harmonium and tabla player. As if playing these two musical instruments was not enough — there’s a void in him which needed to be filled. “When I first heard Shivji in a concert in 1984, I was moved by the experience. At that point in time, I knew my quest for the medium of musical expression was over,” he adds. So that was how he shook hands with destiny more than two decades ago, but it took sometime for him to be accepted by Shivji. “I used to attend all of Shivji’s concerts no matter where he was performing. I think after a while he started noticing me. Since santoors were only available in Kashmir those days, I modified a harp into a santoor and started playing it and when I demonstrated this experiment to him, he gladly accepted me as his student.” Ever since, under the watchful eyes of Shivji, Dilip has evolved into an extraordinary exponent of the santoor. He also performs with the maestro now and then. “Words fail me when I try to express by debt to him. Shivji is not only my ideal in music, but my role model in life,” says Dilip. based on the scale of Rag Vachaspati. like many other Carnatic rāgams. It is the 4th rāgam in the 11th chakra Rudra. The mnemonic name is Rudra-Bhu. prati madhyamam, chathusruthi dhaivatham and kaisiki nishadham. It is a sampoorna rāgam – a rāgam that has all seven swaras (notes). It is the prati madhyamam equivalent of Harikambhoji, which is the 28th melakarta scale. out of which Bhooshavali and Saraswathi are popular. Vachaspati is a Carnatic raga, representing the Vachaspati parent-scale (64th Melakarta). In its Hindustani adaptation, it has the tone material of raga Yaman with a flat (komal) Ni replacing the natural (shuddha). By Hindustani raga grammar, this has been interpreted as the Kalyan parent-scale in the lower tetrachord and the Kafi parent-scale in the upper tetrachord. For Hindustani musicians, Yaman is the most logical reference point for Vachaspati because, strictly in scalar terms, replacing the Shuddha NI of Yaman with a Komal Ni delivers the Vachaspati scale. But, the issue is a little more complicated. The most important aspect of the Yaman-to-Vachaspati transformation is the disappearance of the Ga-Ni axis in first-fifth correspondence. Without the Shuddha Ni, the new raga has to find an alternative axis to revolve around. The treatment of the raga by Hindustani musicians tends to explore several alternatives [Re-Pa, Ga-Dh and Ma^-ni], without being able to settle down with any of them. Such experimental uncertainty is evident in the Vachaspati renderings of musicians of even great stature, as it reflects the current stage of evolution of the raga in the Hindustani system. 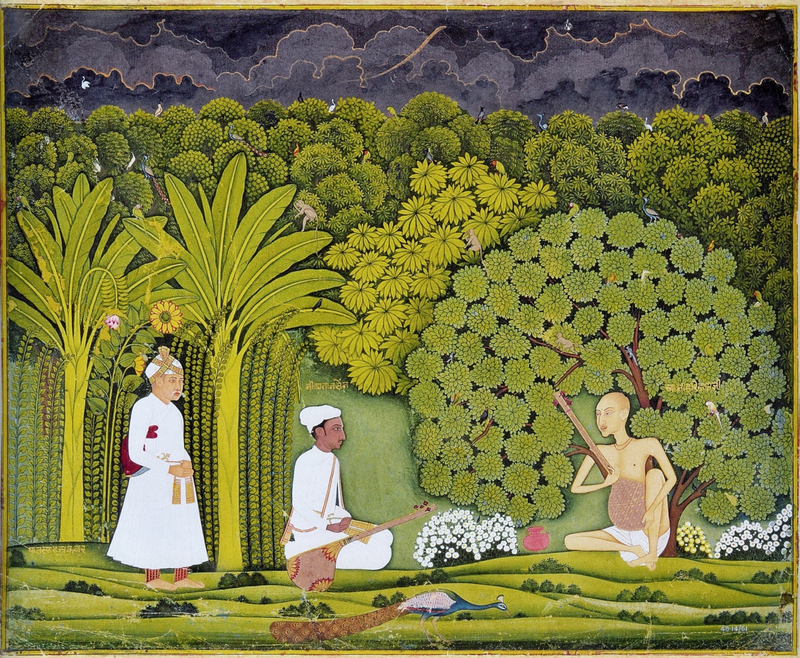 From readily available references, it appears that Pandit Ravi Shankar’s interpretation of Vachaspati is academic, precisely according to its scale. He does not omit Re and Dh in the ascent, as some Hindustani musicians have tended to do. As a result, the lower tetrachord remains close to the Yaman, and the upper tetrachord avoids proximity to the Gawoti/ Kalavati flavour. The melodic centre of gravity remains in the mid-octave region, where the two scales coalesce. Interestingly, and probably to accommodate a suggestion of the Carnatic style intonation, Panditji occasionally uses a subliminal touch of flat (komal) Ga along with the natural (shuddha) Ga and natural (shuddha) Ni along with Sa. Pandit Shivkumar Sharma (Santoor.EMI/HMV: STCS:04B:7375) omits the Re tone in the ascent and frequently omits the sharp (tivra) Ma from the descent. (Ascent: S-G-M^-P-D-n-S’ Descent: S’-n-D-P-M^-G-R-S or S’-n-D-P-G-R-S). Vocalist, Jagdish Prasad (unpublished) omits Re as well as Dh from the ascent (Ascent: S-G-M^-P-n-S’ Descent: S’-n-D-P-M^-G-R-S. The legendary Ustad Ameer Khan, who too had a penchant for Carnatic ragas (e.g. Hansadhwani, Charukeshi, Basant Mukhari/ Vakulabharanam), recorded an untitled and self-composed raga (INRECO:LP: 2411-0001,1982), which appears to be his interpretation of Vachaspati. Why he left it untitled is a mystery. In this raga, he omits Re and Dh from the ascent, and Dh from the descent. (Ascent: S-G-M^-P-n-S’ Descent: S-n-P-M^-G-R-S). Ustad Ameer Khan’s treatment of the Re tone in the descent is fleeting or summary. Vachaspati is increasingly becoming familiar to Hindustani audiences by its chalan (distinctive phraseology). This chalan itself is fluid because of the recency of the raga’s introduction into Hindustani music and the handful of musicians of stature who have worked on shaping its distinctive melodic identity. The variance extends to the predominant mood of the raga, with renditions ranging from the profound to the vivacious and, of course, some which oscillate in between. The transformation of Carnatic ragas into Hindustani melodic entities has been an uneven process. While some ragas like Abhogi, Hamsadhwani, and Kirwani have acquired a stable Hindustani identity reasonably fast, several others are unstable several decades after their introduction. Under such conditions, every musician playing these ragas risks confusion in the audience mind by calling his interpretation by the same Carnatic name. In addition, he also risks the disapproval of those Carnatic-oriented audiences, who might find themselves uncomfortable with all Hindustani treatments in general. This assessment of the risks probably persuaded Ustad Vilayat Khan, in the 1970s, to coin a new name “Chandni Kalyan” for Vachaspati. The word “Kalyan” establishes the raga’s anchoring in the Kalyan parent scale, and its affinity to Yaman, the main raga of the Kalyan scale. 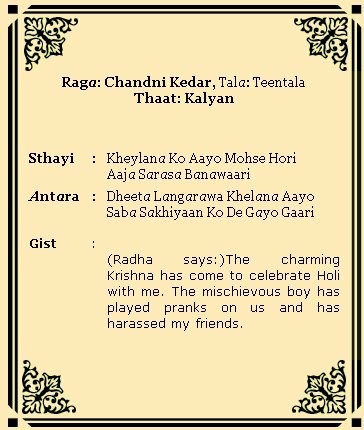 The prefix “Chandni” alludes to the precedent of Chandni Kedar which comes into being by replacing the Shuddha Ni of Kedar with a Komal Ni. Yaman Kalyan undergoes an identical transformation in Chandni Kalyan. The prefix was, therefore, considered appropriate. Though Vachaspati is known to a large number of music lovers, familiarity with the Chandni Kalyan coinage is still restricted to Ustad Vilayat Khan’s audiences. Its logic could, however, assure wider usage for the name, if the raga itself becomes more popular. Musicologists have often argued that Hindustani music tends to adopt merely the scales of Carnatic ragas, without concerning itself with the totality of their raga-ness. The musical approaches of the two traditions are so distinct that a cross-cultural transformation acceptable to both traditions may be impossible. The Hindustani tradition does, however, attempt to achieve a stable melodic personality for each adopted raga which may, or may not, appear satisfactory to aficionados of Carnatic music. The maturation of these personalities requires several musicians of great stature to devote their musical energies to the process. Until this happens, Hindustani as well as Carnatic audiences will perceive these transformations as awkward in their raga-ness. Chandni Kalyan/ Vachaspati might still be at this half-baked stage of raga-ness in the Hindustani tradition. Its authoritative grammar will be written only after its literature has matured. Until then, each musician’s interpretation of it must be accepted on its own terms, and judged only on its distinctiveness and aesthetic coherence. The manufacturing of a Santoor is a complicated and special refined process. This is a family based manufacture site in Srinagar Kashmir working with Santoor for more generations. 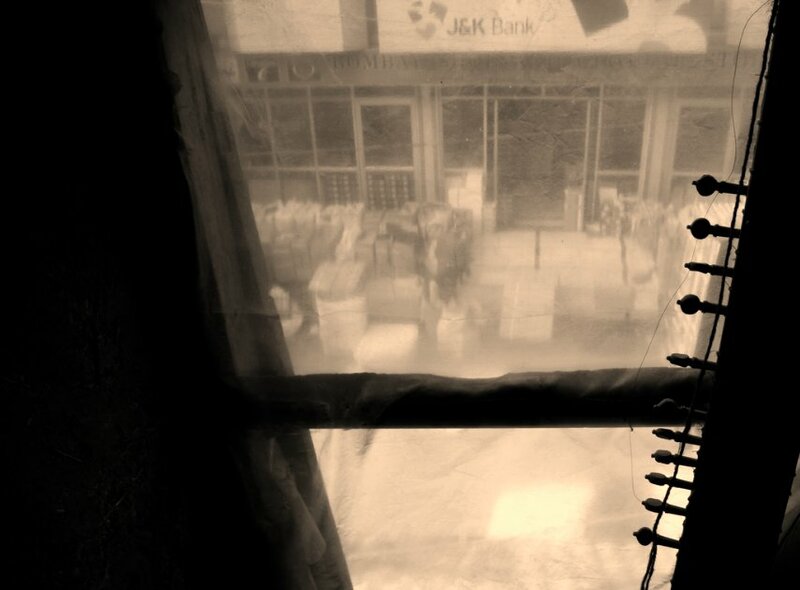 Over a rusted nail in the mud wall above the windowsill hangs a century old peacock shaped musical instrument called tawoos. The dried up texture of its surface play the notes of loss. While the flowing waters of Jhelum could be seen rejuvenating the city outside, inside this workshop, centuries old art is breathing its last. Worn out tools are scattered all around the place. 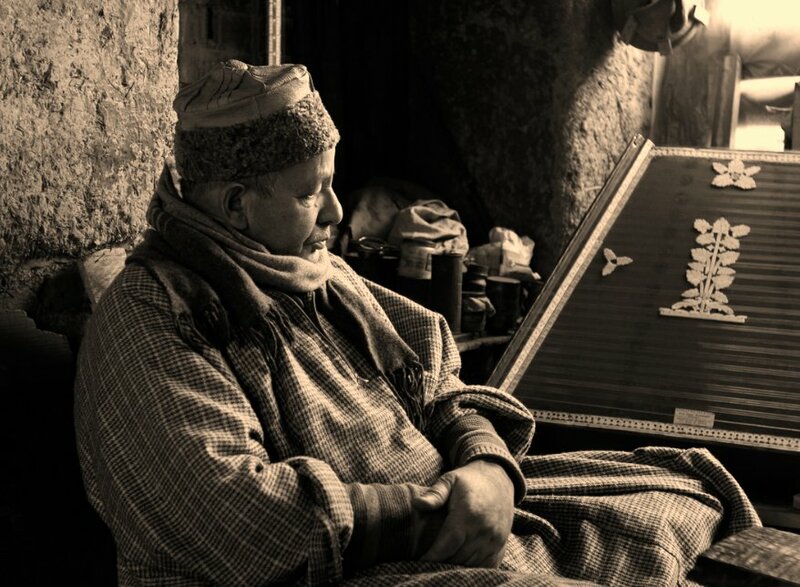 Ghulam Mohammad Zaz sits in one corner with a Santoor in his hand. “It is making noise,” he says, as he again peeps through his under sized glasses on his nose to concentrate on his job. Listening to every string and adjusting each key, Zaz may find out the problem in minutes. Or it may take a day. Whatever the time span, he is the only expert who can set the Santoor right. If he can listen to the beats, he can speak to the music too. Zaz is the only living santoor maker in valley. This rundown shop hidden inside a cluster of houses, however, is not only the last memory of an art-form at the verge of extinction, it’s a reminder of a history too. Seventeen decades back, Ghulam Mohammad Zaz’s ancestor, a man whose name no one remembers, set up a workshop on the banks of Jhelum in Zaina Kadal where musical instruments would be made. His son, Khazir Mohammad learnt the art from him and in turn taught his son Gul Ju. Through successive generations, the art passed to Rahmaan Ju, in whose time the business flourished and made the family famous all over mainland India. Leading musicians would instruments made in this workshop. Rehmaan Ju’s only son, Abdul Ahad took over the business after his father’s death. Now the time had come for passing the inherited business to the seventh successive generation. While Ahad’s elder son Abdul Majeed preferred a government job, his younger son Ghulam Mohammad Zaz was trained by his father. 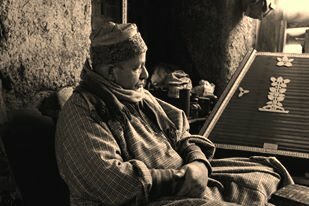 Today Zaz is 65 and the only skilled person of his craft left in Kashmir. He works in the same room, with the same worn out tools that his ancestors used. Unlike his forefathers, however, he cannot pass it to anyone. No one has come to him for learning. And he has no son. 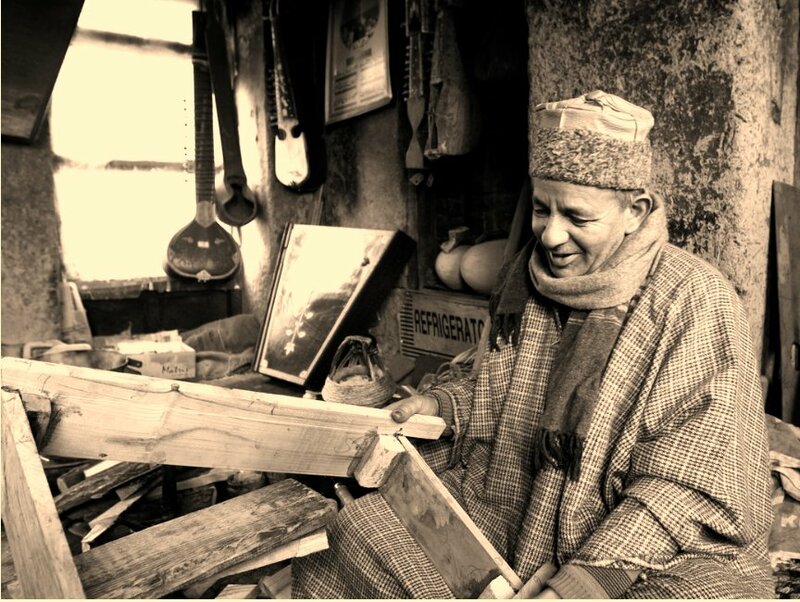 Zaz makes Kashmiri Sitar, Indian Sitar, Rabab, Saarangi, Santoor and Tanpura. Many instruments Zaz knows how to manufacture are not even played today. “There are many other instruments. I don’t want to mention. Nobody will understand. I have buried this art in my heart. It will be buried with me,” says Zaz, while adjusting the strings of a santoor. Above his head, several framed pictures of leading Indian musicians are handing on the wall. “This is Pandit Shiv Kumar Sharma playing my santoor. This one is Bhajan Sopori,” says Zaz. He is proud of it. His silence tells. While the photos tell the story of his fame, deep inside Zaz is a pained man. He is happy with the name this craft has given him, yet he has complaints to make, “Businesses cannot run on mere acclamations. Applauds do not satisfy belly,” says Zaz. It takes at least one month to make an instrument. Mulberry wood is mostly used but the timber should be seasoned to give fine tonal quality. Another type of wood called vireen was earlier used, but now it is not available. The strings are made of different material for different instruments. In instrument Saazi Kashmir, strings are made of silk. In Santoor and Saitaar, they are made of steel. And for Rabab, processed animal intestines especially of sheep are used. At first different parts of instrument are carved out of wood using ordinary tools. After properly shaped, they are then fitted together. 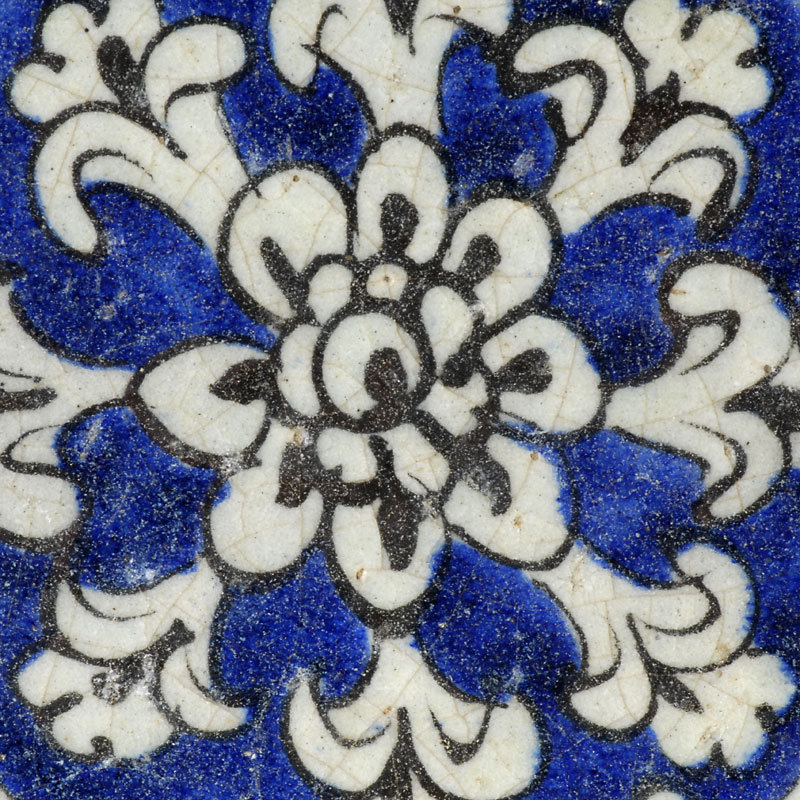 Then comes time of ornamentation in which polishing and painting is done. Earlier instruments would be decorated by fixing flowers on them. The flowers would be made of ivory and the horns of some wild animals. With a ban on hunting, either substitutes made of plastic are used or paint is applied for the same. Instrument the once ready, Zaz sells it for a price anywhere between five thousand to twenty thousand rupees. A mere look at the wood tells Zaz about the quality of tones it can produce, though he does not know how to play instruments. “Just by looking at a tree, I can make out which part of it can give me tonal instrument. It doesn’t require any principle but a vision,” Says Zaz. “My mind is my measuring scale,” he murmurs as if revealing a secret. The only people Zaz caters to are either foreign customers or tourists. Le santour (graphie francisée la plus commune), santûr, santoor, santur, santouri ou santîr est un instrument de musique du Moyen-Orient appartenant à la famille des cithares sur table. Il s’agit d’un instrument à cordes frappées, tout comme le cymbalum ou le piano apparus plus tard, dont il est l’origine commune. On peut aussi le classer comme instrument de percussion mélodique. On en joue en effet à l’aide de deux petits marteaux (mezrab en persan ou en turc) placés entre les doigts. L’étymologie du terme est complexe et sujette à nombre de controverses : il semble dérivé du grec ancien psallo (« frapper ou chanter »), de l’hébreu psantîr ou de l’araméen psantria (dont le psaltérion a hérité), mais on a aussi tenté de le faire dériver du persan ou du sanskrit (sau-târ signifiant « cent cordes »). Sa graphie est tout aussi instable et variée en vertu du caractère aléatoire des transcriptions. Sans doute très ancien (peut-être assyrien selon certains auteurs contestés), ses premières traces écrites ou picturales sous sa forme actuelle ne datent que du XIIe siècle, notamment dans un poème de Manûchehri et sur le bas-relief en ivoire d’origine byzantine, servant de couverture au manuscrit Egerton reçu en 1131 dans le Royaume franc de Jérusalem. Il disparaît alors dans le haut Moyen Âge sans qu’il soit possible de déterminer précisément sa migration. Il réapparaît en effet sous des noms et des formes variés, sa légèreté alliée à des dimensions réduites lui ayant permis de faire partie des instruments migrateurs, adoptés tant par les musiciens itinérants, Tziganes ou Juifs (qui le jouent en le portant en bandoulière), que par les musiciens savants (qui le jouent assis). Il ne faut le confondre ni avec le qanûn, qui est une cithare orientale se jouant avec les doigts munis d’onglets en pinçant les cordes, ni avec le sintîr qui est un luth maghrébin. Étant donné le grand nombre de cordes mises en œuvre, le santour est un instrument à l’abord difficile : il suffit d’essayer d’accorder ensemble 12 guitares pour comprendre ce sacerdoce. 72 ou 100 cordes à accorder (en chœurs de trois ou quatre) quotidiennement n’est pas une mince affaire quand il n’y a pas une structure en acier (comme pour le piano) pour les maintenir en place, mais une simple lutherie entièrement en bois noble (noyer ou chêne), mises à part les chevilles, tout comme pour le clavecin. La particularité de pouvoir jouer plusieurs cordes en même temps et successivement en « accord ouvert » offre une grande richesse de résonances et d’harmoniques accentués par l’absence d’étouffoirs sur les baguettes. Comme rien n’arrête la vibration de la corde, elle a un sustain, une tenue très longue (près de 20 s), et il se produit alors une forme d’harmonie non pas groupée en un accord simultané, plaqué, mais groupée de manière successive, ce qui rend le jeu difficile, car une note ou ses harmoniques peuvent continuer de sonner alors que d’autres notes et harmoniques se font entendre en même temps. Les chœurs de trois ou quatre cordes accordées à l’unisson permettent aussi une amplification du son par sympathie et vibration réciproque entre elles d’une part, et avec celles à l’octave inférieure ou supérieure, d’autre part. Toutes ces caractéristiques acoustiques en font un instrument très efficace pour la musique modale, mais très limité pour l’harmonie tonale, qui se joue avec des accords (de trois notes simultanées au moins). L’effet polyphonique est saisissant puisqu’on a l’impression d’entendre plusieurs instruments en même temps quand il est joué, étant donné la rapidité de succession des notes « toutes faites » (comme au piano) ne nécessitant pas une préparation par un placement des doigts (comme au luth). Il existe cinq types de santours plus ou moins proches les uns des autres. Ils ont certaines caractéristiques communes les différenciant des autres cithares à cordes frappées tels les cymbalums d’Europe orientale ou les yangqins d’Extrême-Orient : la forme trapézoïdale à angles prononcés de la caisse de résonance ; les chevalets mobiles, en nombre restreint et en forme de pions d’échiquier ; les chevilles insérées dans le côté droit perpendiculaire à la table d’harmonie ; des âmes placées sous la table d’harmonie ; l’accord diatonique ; les baguettes à encoches facilitant la préhension par les doigts. Seul le santouri fait exception en étant un type hybride avec le cymbalum. C’est le plus ancien et le plus petit de la « famille ». Très sobre esthétiquement et très brillant pour la sonorité. Si le santûr (سنتور en persan) est resté si petit et si sobre, c’est qu’il devait littéralement circuler sous le manteau, la musique n’étant pas très bien perçue dans le monde musulman en général, chiite en particulier, mise à part la cantillation du Coran, si bien que ce sont parfois des musiciens de confession juive qui ont pris part à sa préservation. De même le témoignage de Jean-Baptiste Tavernier, faisant état d’échanges de musiciens (jouant du santour) entre la France et l’Iran au XVIe siècle montre qu’il existait des influences mutuelles insoupçonnées. Il fut ensuite réservé à la méditation intimiste et aux oreilles du Shâh jusqu’au XIXe siècle. Ce type d’instrument est également apparu de manière épisodique en Arménie en ce temps-là, avant de disparaître au XXe siècle pour y réapparaître très récemment. Le XXe siècle devait voir en Iran l’essor de pédagogues virtuoses qui assurèrent la pérennité de l’instrument. Suite à la Révolution iranienne de 1979, nombre de musiciens iraniens s’expatrièrent en Europe, en Israël, aux États-Unis ou au Japon. Cette diaspora a contribué à faire connaître l’instrument en l’intégrant notamment à d’autres styles musicaux que la musique traditionnelle (jazz, world, classique, etc.) ; aujourd’hui il est fort répandu, y compris parmi les Iraniennes, qui l’apprécient beaucoup. Il a par ailleurs complètement supplanté le qanûn qui a pratiquement disparu d’Iran. Santûr avec mezrabs et clef d’accord. Le santûr iranien a 72 cordes, disposées par chœurs de quatre sur 18 chevalets (kharak) mobiles placés sur une table d’harmonie trapézoïdale (90 x 38 x 5 cm) formant un angle à 45°. Il peut être de taille légèrement différente selon qu’il soit pour voix d’homme ou de femme. Des versions modernes ont quelques cordes en plus permettant des transitions entre les modes musicaux. La structure de la caisse de résonance et les chevalets (dont les sillets sont en métal, de même que ceux disposés le long des côtés) sont en bois dur (noyer, chêne, bouleau, mûrier…) alors que la table d’harmonie est en bois plus tendre (hêtre, acajou…). Étant donné l’énorme pression des cordes sur la table (plus d’une tonne), il faut une certaine épaisseur (6 à 10 mm) ainsi que des âmes réparties en des endroits clés (4 ou 5 notamment sous les rosaces) assurant à la fois solidité et résonance. Tout est collé à l’ancienne à l’aide de colle de nerfs ; il n’y a aucun clou ou vis. Deux petites ouïes, en forme de fleurs ou de rosaces, permettent une meilleure circulation de la résonance. Elles sont complétées par une ouverture au milieu de l’éclisse arrière, assurant un plus grand volume sonore et permettant le réglage des âmes. Les cordes graves (placées sur les chevalets à droite) sont en bronze ; les aiguës (placées sur les chevalets centraux) sont en fer ou en acier (plus résistant mais moins brillant). Les chevilles, placées sur le côté droit, sont coniques et lisses, bien qu’on ait utilisé longtemps des filetées ; une clef d’accord est utilisée pour les serrer. De simples clous permettent la fixation des cordes sur le côté gauche. Grâce à l’angulation retenue pour la caisse de résonance (45°), les cordes sont toutes du même calibre, puisque celles réservées aux basses auront naturellement une longueur supérieure à celles dévolues aux aigus. Les baguettes ou marteaux (mezrab) ont 20 cm de long, avec un bout recourbé (comme un patin) parfois agrémenté de feutre, et l’autre avec une encoche ou un anneau facilitant la préhension. Ils sont extrêmement légers (4 g), très fins (2 à 3 mm) et très résistants grâce aux bois durs employés (buis, néflier). Alors que traditionnellement ils étaient droits, ils sont très souvent courbes aujourd’hui. Il existe deux grandes écoles de jeu pour le mouvement des mezrabs, tenus fermement au bout des cinq doigts : les anciens en jouent avec les seuls poignets (bascule haut bas, sans mouvement de doigts ou de bras) et plutôt loin du santûr, mais les modernes se servent plus de leurs doigts (bascule avant arrière des seuls majeurs-annulaires-auriculaires, avec mouvements de poignets et de bras) et jouent très près de l’instrument ; de temps en temps aussi, ils étouffent le son de l’instrument avec la main ou avec un morceau de soie. L’accord est diatonique et variable, avec des quarts de tons selon les modes persans, les dastgâhs. Le registre est de 3 octaves et demie (de Mi3 à Fa6) disposées en trois sections parallèles grâce à un artifice acoustique : la série de neuf chevalets (en forme de pions d’échiquier) médians est utilisée pour séparer en deux parties distinctes (ratio de 2/3) les séries de cordes en acier, offrant ainsi en frappant successivement sur celles de droite puis sur celles de gauche, le médium et l’aigu à l’octave, alors que la série de neuf chevalets à droite de l’instrument, réservée aux basses, ne se percute qu’à gauche. Les deux premiers chevalets servant en outre de pédale de basse et de note modulable. Cette disposition est astucieuse également pour le jeu : en effet, le musicien ne pourrait pas s’y retrouver devant tant de cordes. Avoir deux séries séparées de chevalets offre une différence de hauteur de corde par rapport à la table d’harmonie : elles se croisent en son milieu et remontent chacune de leur côté, offrant ainsi un dénivelé visuel. Celui-ci est aussi augmenté par le fait que les chevalets sont disposés en quinconce, si bien qu’on a toujours un chœur de cordes en haut puis un en bas, etc. Pour changer de modes, il faut bien sûr réaccorder l’instrument, mais cela peut être effectué rapidement de manière temporaire en s’arrêtant de jouer et en déplaçant, à gauche ou à droite, les chevalets amovibles (les tentatives d’user de roulettes ou de billes n’ont guère convaincu) ; cet artifice trouble parfois la justesse de l’instrument et élimine d’emblée tout jeu sur la partie décalée de la corde (à gauche du chevalet qui n’est plus à l’octave. On en joue toujours assis (ou à genoux), par terre ou sur une chaise, l’instrument reposant soit sur les genoux soit devant le musicien (« santouriste »), sur une table ou un tapis… Le jeu est très virtuose (par ex. un chaharmezrab correspond à une succession rapide de mouvement « Droite » et « Gauche » du genre : DDDG – DDDG – DDDG… où D=Do6 et G=Do4 et Fa4 successivement) et demande une dissociation mentale afin de pouvoir jouer d’une main un rythme et de l’autre une mélodie rythmée différemment, tout en donnant aussi les accents du rythme, à la manière du piano et autres instruments polyphoniques qui du reste l’influencent de plus en plus, provoquant une évolution très importante de la technique. La qualité de la production sonore dépend, en outre de la lutherie, d’un style de frappe particulier : le zang. Il correspond à un « fouetté » ou un « claqué » du poignet qui provoque une frappe très sèche et très rapide ; de ce fait, lors de l’impact sur les cordes, le temps et la surface sont réduits au minimum, augmentant la limpidité sonore. Une autre frappe, le riz, est très importante : il s’agit de la succession très rapide de coups droits (râst) puis gauches (chap) qui provoque un roulement caractéristique (D-G-D-G-D-G-D…) et où l’inertie des baguettes ne peut ici être employée. Le santûr se prête à l’exécution du radif, corpus écrit savant de la musique iranienne, mais aussi des pièces populaires motrebi ou folkloriques (de la musique kurde). Il peut se jouer seul, en duo, en ensemble, ou accompagné d’une percussion (tombak ou daf) ou d’un orchestre (il existe des concertos). L’usage de partitions occidentales s’est répandu depuis son enseignement en conservatoire. Il existe aussi des méthodes d’apprentissage. Ses principaux interprètes contemporains sont Faramarz Payvar, Madjid Kiani et Parviz Meshkatiân. Possiblement aussi très ancien dans le sud du pays (selon les avis partagés des musicologues débattant de la signification d’une « vîna à cent cordes » ou shatatantri vîna) mais disparu, il est apparu tardivement dans le nord de l’Inde, au Cachemire (le poète Nowshehri le cite au XVIe siècle), certainement sous l’influence perse par la route de la soie (la présence du santoor en Afghanistan, au Pakistan ou au Népal n’est qu’anecdotique). Il est plus grand, plus lourd, plus volumineux et plus sonore. Il est également plus décoré soit par des bas-reliefs, soit par des appliques de marqueterie. Tout ceci tient au fait que la musique indienne était une musique de cour et qu’il fallait jouer devant des maharajas ou des nawabs avec d’imposantes suites dans de grands halls. C’est le seul instrument indien (en plus du swarmandal, une cithare jouée avec les doigts, qu’il ne faut pas confondre) incapable d’exécuter des micro-modulations sur une note (meend) et il est de ce fait surprenant de le voir interpréter aujourd’hui la musique savante dont une partie du répertoire lui demeure fermée; aussi c’est encore un instrument rare. Le santoor indien a une caisse de résonance trapézoïdale imposante (80 cm x 60 cm x 8 cm) en teck ou en noyer, et à l’angle de 60°. De 96 à 130 cordes passent sur les 24 à 30 sillets en os de chameau des chevalets amovibles (du type pions d’échiquier) placés sur une table d’harmonie de qualité très variable, souvent en contreplaqué… Le tout est collé (à la colle blanche) et cloué avec en outre des joints de menuiserie. Les chevalets sont organisés en deux séries de 15 presque parallèles à l’angle de la caisse de résonance (ratio 1/6) ; il n’y a pas de série centrale, mais deux séries latérales, l’une à gauche, l’autre à droite, et la disposition des notes ne va pas de gauche à droite, mais de bas en haut, si bien que les basses sont en bas et les aiguës, en haut, indifféremment de toutes considérations de côté. Il n’y a aucune ouïe (sauf exception) comme dans tous les instruments indiens, mais il y a bien des âmes parfois remplacées par des barrages de soutien (physique plutôt qu’acoustique). L’éclisse arrière comporte un large trou pour permettre le réglage des âmes ainsi que le transport de l’instrument, à moins qu’une poignée n’y soit rajoutée. On utilise au moins huit calibres différents de cordes hétérogènes (acier, fer, bronze, laiton, filetée) placées en chœurs de deux, trois ou quatre, ce qui ne facilite pas la maintenance. Les chevilles, ni filetées ni lisses, sont placées sur le côté droit de la caisse de résonance. De simples clous sont placés sur le côté opposé afin de maintenir les cordes. Les baguettes ou mezrabs, tenues avec trois doigts, sont de forme similaire mais avec un poids et une épaisseur bien supérieurs, ce qui provoque deux nouvelles utilisations : le musicien se sert du poids du mezrab à titre de rebond afin de créer des trémolos (ce sont des riz non contrôlés). De plus, il peut aussi le faire glisser sur les cordes et obtenir un son de vibration très feutré, grâce à des mini-encoches réalisées sur l’avant recourbé en forme de patin. Les Indiens sont accoutumés de se servir aussi de leurs doigts ou mains afin d’étouffer le son ou de faire quelques arpèges en pizzicato, voire un glissando par pression sur une seule corde. L’accord est diatonique et variable selon les modes indiens, les râgas, bien que la structure de l’instrument pourrait accueillir une échelle chromatique. Il a un registre de 2 octaves et demie disposées en deux sections parallèles (de Do3 à Sol5). Curieusement, les Indiens ne jouent que sur une seule section à la fois (celle de droite, mises à part les pédales de basses et celle de bourdon réservée à l’exécution très rapide ou jhalâ), réservant l’autre pour un autre mode diatonique ou râga. On ne frappe ainsi que d’un côté d’un chevalet de telle sorte que le jeu va plutôt vers l’avant que vers la gauche ou la droite. Bien qu’amovibles, nul ne bouge jamais les chevalets. On en joue assis par terre, l’instrument posé sur les genoux ou sur un petit pied. Le jeu est moins virtuose qu’en Iran, mais tout aussi rapide et rythmé. Ce n’est que très récemment qu’il a été intégré à la musique hindoustanie à titre d’instrument soliste, se cantonnant jusque-là au folklore et à la musique soufie (sûfyâna kâlam) dans la musique cachemirie, joué en petits ensembles. Cette limitation géographique couplée au fait que les musiciens ne se servent que d’une seule partie de l’instrument pour jouer, laisse supposer qu’il s’agit bien d’une importation par la route de la soie, plutôt que d’un instrument autochtone au développement parachevé. Il se joue toujours accompagné de percussions (tablâ), parfois en duet (jugalbandi). Il a aussi intégré les orchestres œuvrant au sein de Bollywood, pour la musique filmi. Outre des compositions, le répertoire laisse une large part à l’improvisation et à l’échange avec le percussionniste. Il s’apprend par imitation et mémorisation auprès d’un gurû (« maître »), la tradition orale indienne faisant fi des partitions. Ses principaux représentants sont actuellement Shivkumar Sharma, Tarun Bhattacharya et Bhajan Sopori. Il est très exactement situé entre l’iranien et l’indien, tant du point de vue structurel que musical. Bien qu’étant l’élément central de l’ensemble classique chalghi (ou tchalghi), il ne survit pratiquement plus que dans la diaspora (juive irakienne) et il est devenu extrêmement rare depuis la guerre du Golfe. 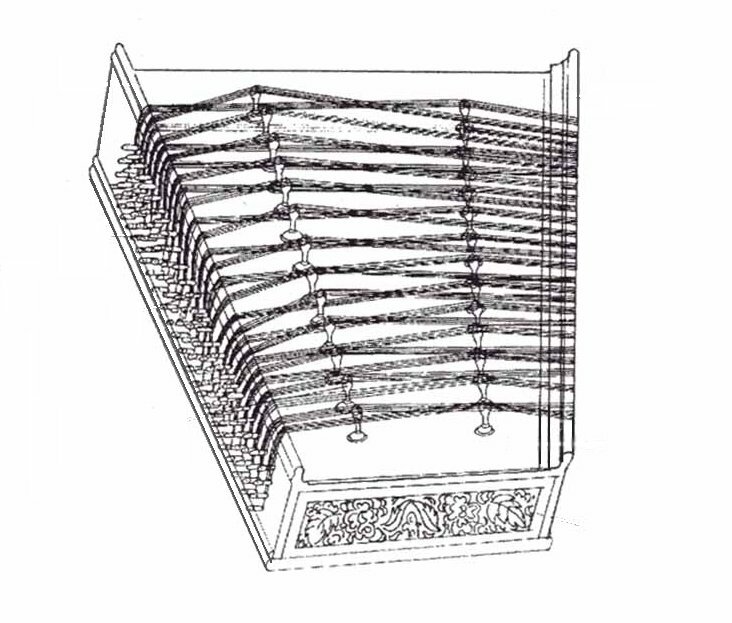 Le santur irakien a une taille (100 cm x 55 cm x 9 cm avec un angle à 50°) et une structure générale intermédiaires (23 à 25 chevalets amovibles supportant, sur des sillets métalliques, 80 à 92 cordes en chœurs de trois, quatre ou cinq). La caisse de résonance est en noyer, abricotier ou oranger, et la table d’harmonie en hêtre ou en contreplaqué. Des ouïes ou des rosaces importantes à formes variables y sont pratiquées. Les mailloches (madarib ornées parfois de feutre et tenues entre trois doigts) et les chevalets (appelés « gazelles ») sont en chêne. Les chevilles sont placées sur le côté droit. De simples clous maintiennent les cordes sur le côté gauche. Les chevalets sont organisés de la même manière que pour le santûr iranien, mais au lieu d’avoir deux séries de neuf chevalets, on a une série de onze à droite dont les quatre derniers en bas, sont placés encore plus à droite, assurant des basses profondes, que l’on joue uniquement en frappant à gauche, et une série de douze au centre (ratio 2/3), que l’on joue de part et d’autre. L’accord est diatonique selon les modes irakiens, les maqâmat. Il offre un registre de plus de trois octaves (de Sol3 à La6). Il se joue posé sur une table, le musicien assis sur une chaise. Rarement joué en solo, il s’intègre plutôt aux petits ensembles interprétant la musique irakienne savante (chalghi composé en outre de djoza, naqqara, nay, oud et riqq) dans les milieux citadins (Bagdad, Mossoul, Bassora, Kirkuk, la diaspora du Caire et de Tel Aviv) où il est parfois joué par des musiciens de la communauté juive, et aux ensembles de musique kurde (avec oud et zarb). Hoogi Patao était l’interprète le plus connu de cet instrument ; Amir El Saffar et Wessam Al-Azzawy lui succèdent aujourd’hui. Bien que recensé depuis le XVIIe siècle, ce n’est qu’à la fin du XIXe siècle que le santur se propage en Turquie, surtout dans la région de Smyrne (Izmir), dans les communautés grecque, juive ou tzigane, du fait de la réticence de la communauté musulmane sunnite envers la musique. On en rencontre alors deux types – alafranga et alaturka – appelés tous deux à disparaître au XXe siècle malgré la séduction qu’ils suscitent encore; certaines études récentes tendent pourtant à faire de la Turquie le berceau des santours. On peut se demander d’ailleurs dans quelle mesure le santouri grec diffère du santur turc, au-delà des questions d’accord ? Le santur alafranga ou fransiz (« des Francs » désignant ici le tambal des Roumains) avait 160 cordes et 32 notes et était surtout joué par des musiciens juifs ou rroms dans des groupes instrumentaux. Très vite les Turcs l’adoptent sous le nom de hamaili santur, et l’adaptent en changeant la place des chevalets et le nombre de cordes (105 et 24 notes). Mais l’insuffisance de ses notes diatoniques le rendant impropre à l’exécution de la musique savante turque, les musiciens le délaissèrent même si certains passionnés composèrent des centaines d’œuvres pour lui. Le santur alaturka ou turki le remplaça alors ; perdant dans l’étendue de son registre, il gagna dans la variété de ses notes. Il était non seulement chromatique, mais en plus capable de rendre des quarts de tons (comme certains pianos orientaux). Toutefois il était encore très loin d’offrir le nombre de notes suffisant à l’exécution de la musique ottomane qui divise l’octave non pas en douze, mais en vingt-cinq notes minimum. Des reconstitutions modernes font état d’un instrument ressemblant au santouri par la caisse de résonance, mais avec trois rosaces au lieu de deux, et un système simplifié de chevalets, positionnés comme ceux du santoor indien, mais solidaires, non amovibles et augmentés à leurs côtés, de leviers similaire à deux du qanûn. Ces instruments n’ont jamais gagné le cœur des musiciens citadins, et sont restés dans les campagnes ou avec les minorités. Aujourd’hui, il n’y a que de très rares interprètes qui comme Oktay Özkazanç, ou le Dr. Ümit Mutlu, continuent de le modifier en le faisant évoluer structurellement, mais achoppent tous devant le même problème du rendu de l’intégralité des notes. Il a aussi quasiment disparu de Turquie pour des raisons de modulations musicales. En effet, sous la poussée de la musique arabe plus modulante, la musique turque s’est mise en quête d’effets et a donc abandonné un instrument incapable de moduler de manière microtonale, à l’instar du qanûn qui l’a supplanté puisqu’en un clin d’œil, il peut offrir une palette de plusieurs altérations d’une même note, par l’abaissement des petits leviers mandals, ce qui ne gêne guère l’exécution puisqu’il se joue avec des ongles aux doigts et non des baguettes (il semble que ce système soit adapté avec succès à présent). L’instrument, prononcé en grec sanduri (σαντούρι), est le plus récemment apparu (début XIXe siècle). Il est assez différent des précédents et est beaucoup plus grand du fait qu’il est chromatique. Il s’apparente ainsi davantage au cymbalum, notamment par le système complexe des nombreux chevalets ; toutefois son accord — linéaire et non sinueux — le rapproche du santûr diatonique. Il est très certainement arrivé avec les vagues de réfugiés grecs de l’Empire ottoman, notamment de Smyrne, où il se jouait dans les cafés aman. Concentré sur l’île de Lesbos au départ, il s’est répandu de manière confidentielle dans les îles égéennes (Chios, Imbros, Samos), du Dodécanèse (Rhodes, Kos, Kalymnos, Nisyros, Leros, Symi), dans les Cyclades (Andros) et sur le continent autour d’Athènes, en Thessalie, en Épire et au Péloponnèse. Du fait de l’influence musicale roumaine et turque, le santouri se rencontre sous deux formes similaires mais à l’accord fort différent : la version insulaire dérive du santur turc, tandis que la version continentale dérive du tambal roumain. Le santouri grec est imposant par sa taille (100 cm x 60 cm x 10 cm avec angle à 70°) et par la disposition des cordes offrant six sections de jeu. La caisse de résonance est en érable, en hêtre ou en bois de rose laminé ; les côtés sont coupés en deux et recollés en inversant le fil du bois afin d’assurer une meilleure stabilité. La table d’harmonie en épicéa ou en sapin est percée de deux grosses ouïes hexagonales avec sept trous ronds (ou deux grosses rosaces rondes) placées au centre et à gauche de la série de chevalets médians. Il a environ 115 cordes (en acier, en bronze et en cuivre fileté) disposées en chœurs de 2, 3, 4 ou 5 sur cinq séries de chevalets (non amovibles, reliés par des sillets en métal) composés de barres de soutien creusées pour permettre leurs passages. L’accord est complexe et rend le jeu difficile du fait des croisements lors des changements de série de chevalets. Les chevilles filetées sont placées sur le dessus, à droite, à côté de la table d’harmonie, et non pas sur le côté de la caisse de résonance. Là aussi il faut des calibres de cordes différents pour assurer le rendu correct des harmoniques de l’échelle chromatique. Les mailloches sont imposantes (25 cm), lourdes, toujours entourées d’étoupe à l’extrémité, afin de feutrer le son, et jouées avec les poignets, bien que tenues penchées, entre deux ou trois doigts (autrefois on en jouait aussi avec les avant-bras, d’un peu plus loin, avec les baguettes tenues droites, dans lesquelles étaient creusés des trous pour les index). L’accord est chromatique avec deux variantes de disposition : l’une qui reprend les modes diatoniques grecs hérités de l’Empire ottoman, les dromois ; l’autre reprend l’accord du tambal roumain. Il offre un registre de 3 octaves et demie (du Fa3 au Si6). Il se joue soit assis, posé sur une table devant soi ou sur les genoux, soit debout, suspendu à hauteur de hanches par une sangle passée au cou du musicien. Sa palette est aussi bien mélodique qu’harmonique ; il se prête autant au solo, qu’au duo ou à l’accompagnement. Avec ou sans partitions, on y joue tout autant le folklore dansant de la musique grecque, que le smyrneiko ou le rébétiko, ou encore la musique ottomane. L’improvisation compte beaucoup et elle peut être soit selon le taksim turc, soit selon la doina de la musique roumaine. Certains artistes ont tenté de développer un style de jeu à quatre mailloches. Certains facteurs d’instruments ont tenté de développer aussi des versions basse ou soprano. « Depuis que j’ai appris à jouer du santouri, je suis devenu un autre homme ». Alexis Zorba. Le santour a connu un destin complexe tant en Asie, qu’en Europe ou en Amérique, adoptant d’autres dénominations et caractéristiques. On rencontre aussi à présent des santours électro-acoustiques (avec caisse de résonance amplifiée), voire électriques (sans caisse de résonance). Enfin, le sur santoor inventé récemment, n’a plus rien à voir avec le santour, si ce n’est sa forme, car il se joue avec les doigts. 1. (de) Tobias Norlind, Systematik der Saiteninstrumente, Geschichte der Zither, Stockholm, 1963. 3. (en) Alexander Buchner, Folk Music Instruments of the World, Prague, 1971. 4. (en) David Kettlewell, The Dulcimer, PhD thesis. History and playing traditions around the world, 1976. 5. Jean During, La musique iranienne : Tradition et évolution, A.D.P.F., Paris, 1984. 6. (en) O.M. Dalton, Catalogue of the Ivory Curtains of the Christian Era .. in the .. British Museum, London, 1909. 7. (en) Stanley Sadie, The New Grove Dictionary of Musical Instruments, Oxford, 1984. 8. Alain Chaoulli, Les musiciens juifs en Iran aux XIXe et XXe siècles, L’Harmattan, 2006. 9. Amnon Shiloah & Cyril Aslanov, Les traditions musicales juives, Maisonneuve & Larose, 1995. 10. Yann Richard, Entre l’Iran et l’Occident : adaptation et assimilation des idées et techniques occidentales en Iran, Éditions MSH, 1989. 12. (en) Javad Naini, Introducing the Persian Santur. 13. Jean During, La musique iranienne : Tradition et évolution, A.D.P.F., Paris, 1984. 14. (en) B. C. Deva, Musical Instruments of India, Calcutta, 1978. 15. (en) K. Ayyappapanicker, Medieval Indian Literature, An Anthology, Sahitya Akademi, 1997. 16. (en) Sandeep Bagchee, Nâd, understanding Râga Music, Mumbai, 1998. 17. Schéhérazade Qassim Hassan, Les instruments de musique en Iraq, EHESS, Paris, 1980. 18. (en) Yeheskel Kojaman, Jewish Role in Iraqi Music, 1972. 19. (en) Dr Umit Mutlu, The santouri in Turkey. 20. (en) David Kettlewell, The Dulcimer, PhD thesis. History and playing traditions around the world, 1976. 21. (en) Pav Verity, Santouri Article, 2003. 22. Nikos Kazantzakis, Alexis Zorba, Paris, Plon, 1963. 23. (en) David Kettlewell, The Dulcimer, PhD thesis. History and playing traditions around the world, 1976.